Summer Reading Fun Week #9: Welcome Back - Time to Unpack! The long summer break is slowly coming to an end. Teachers will be returning to school on Tuesday and you, the students, will join us next week. It is the perfect time for you to unpack what you have brought back from your (reading) journey and travels. Start this week by browsing through your summer reader’s notebook and/or look at photos you and your family might have taken, or if you haven’t, simply spend some time thinking and reliving the exciting moments of the past eight weeks. Write down one or more lists that highlight some of your holiday fun. ​The Fantastic Flying Books of Mr. Morris Lessmore (William Joyce). If you still have time to spare, how about drawing a picture of yourself as a reader, maybe surrounded by some of your favorite books. You could also make a collage, adding text to it and anything else that shows who you are as a reader, what you like, what you are passionate about and more. Ms. Alison and I will be getting the library ready for you this week and look forward to seeing you next Tuesday. Enjoy your last week off! Summer Reading Fun Week #8: Welcome (Back) To Asia! We have been reading and traveling together for seven weeks already and are now on our homestretch, back in Asia. While we started exploring books about Hong Kong at the beginning of our journey, I want to highlight some stories from other parts of Asia this week. There are so many exciting things to see and talk about on this continent, which consists of 48 countries, and is the largest of the seven continents. ​I have always admired the arts and crafts coming out of Asia and therefore want to suggest some additional activities related to that, in addition to the book titles from Asia and by Asian authors. Do some origami this week (the Japanese art of folding paper). Try out some Chinese calligraphy. If you are already in Hong Kong, you could get the original ink stone and brushes to work with. During the past week, I enjoyed some more beautiful summer weather in Germany and read a thought-provoking novel for older (Secondary School) readers: Sommer Unter Schwarzen Fluegeln by Peer Martin (unfortunately, so far the book is only available in German). Set in present-day Germany, it tells the story of a young woman from Syria, who lives with her family in a refugee center, and a member of a radical rightwing youth group, who fall in love. As Nuri tells the story why and how she and her family fled Syria, the reader learns much about the war that forced so many people to seek refuge in neighbouring countries and Europe, but also introduces the reader to Syrian culture, tradition and beliefs. At the same time, the story gives insights into how rightwing groups in Germany gain support. It was quite haunting at times and I had to read the story in small chunks but I am glad I got to read it and gain a better understanding of this terrible war and the resulting refugee situation. I am hoping that the book will be translated into many languages and read by many. Such an important story! Summer Reading Fun Week #7: Hello Australia! While I have never been in person to Australia, I am dreaming of the day I will be able to visit. Through the many books I have read, written by Australian authors and about Australia, I am totally curious to see everything for myself. Well, maybe not everything. I am not a big fan of critters and snakes and wouldn’t want to meet up with any of those (and I hear there are lots...). Most Australians love the outdoors so I want to encourage you to do (and write and draw about) some fun outdoor activities this week. Organize a picnic or barbeque, go camping (I loved camping in our backyard when I was a kid), go on a hike, wherever you are in the world right now and write, sketch and draw about the things – little and big – you see along the way. And here a bit from my summer holidays, not related to reading. Last week, I enjoyed a very special event with my family: watching an exhibition match between Bayern Munich and Manchester City. I have to admit, I am not a Bayern fan (but my daughter and my nephew are) but the atmosphere in the stadium was really great and so I had the best of times as well. Summer Reading Week #6: Welcome to the Caribbean! I know, the Caribbean islands are not a continent but rather a part of the Americas... but who does not love this part of the world? It’s such a beautiful and vibrant place, consisting of 28 island nations and more than 7,000 individual islands. Some of the bigger and better known islands are Cuba, Jamaica, Haiti, Dominican Republic, and Puerto Rico. I hope you don’t mind that I decided to put in an extra stop before we are heading to our next continent. If you have Internet access, look up some photos from the Caribbean, for example on the National Geographic website. Over the past couple of years, I have come to love and appreciate the writing of two Cuban authors in particular: Alma Flor Ada and Margarita Engle, and I therefore want to highlight their beautiful books this week. Both have written and continue to write a variety of genres in picture book and novel format: memoirs, biographies, realistic and historical fiction. Many beg to be read out loud. And if you want more mystery and adventure from the Caribbean, have a look at Carol Ottley-Mitchell's Caribbean Adventure Series. I hope also this week, you discover something new and exciting to read. Summer Reading Week #5: Hello Americas! This week we are stopping on not just one, but two continents: North America and South America (you get some extra book suggestions as a bonus ;) I have to admit that I did not know until recently where the name of these two large continents came from: from the Italian explorer Amerigo Vespucci. Isn’t that surprising, considering the fact that Christopher Columbus was the first to land in what is today America? Watch a movie of a book you have read. Summer Reading Week #4: Hello Europe! Our next (summer reading) stop takes us to Europe, which is theoretically not its own continent since it is connected with Asia. Modern day Europe consists of 50 countries, each with their own language and culture. It is the second smallest continent (Australia being the smallest). From a literature point of view though it is far from being small. Think of all the tales, stories, novels, and plays that have been and are still being written in Europe. Think of the Brothers Grimm or Shakespeare for example. If you have a bit of extra time, check out this great video with 25 Facts About Europe That Most People Don’t Know – really surprising! ​So many wonderful books, so many beautiful places to see, special people to meet - that's what I love about reading. I have read some wonderful stories already this summer and keep reading and enjoying. I hope you do too! Summer Reading Week #3: Hello Africa! The first stop on our reading journey around the world as we are heading east is the African continent. Did you know that the African continent consists of 54 countries, covering a total area of close to 12 million square miles and having an estimated population of over a billion? It is therefore the second largest and second most populous continent. Have a look at a map of Africa and select one country that interests you. If you have Internet access, use the resources on the Primary Portal to discover five fun/curious facts about the country. Otherwise, look for answers at your local library. 1. Ghana used to be called the Gold Coast because it is rich in gold and other natural resources. 2. Ghana is the second largest producer of cocoa beans (and therefore you can get delicious and healthy chocolate in Ghana). 3. While English is Ghana’s official language, more than 250 languages and dialects are spoken in Ghana. 4. Ghana has rich storytelling traditions, Kweku Ananse, the trickster spider, being one of the best known and most loved characters. 5. Ghana has a space program since 2012, planning to launch its first satellite in 2020. And here a sneak peek at where I am at the moment and what books I have enjoyed recently. Summer Reading Week #2: Goodbye Hong Kong! How has the start to your holidays been? I hope everything has been great so far. The weather here in Hong Kong is definitely treating us to a magnificent start and I have enjoyed being outside reading. Hong Kong is such a fascinating place, with so much to see and discover, we cannot embark on our reading journey around the world before having spent some time reading and appreciating a couple of (fiction) books set right here in Hong Kong. And should you still be in Hong Kong at this time, why not try to find one or more of the locations in the books? Wouldn’t that be fun? Enjoying some of the wonderful street food mentioned in Hong Kong! by chef Giada De Laurentis. Lulu the Hong Kong Cat and the Hong Kong Time Machine (Ellen Leou) – or any of Lulu’s other adventures. See you next week for more summer reading fun - and/or check out other summer reading resources on the HKA Primary Portal. Summer Reading Week #1: Pack Your (Reading) Bags! Welcome to our reading adventure around the world! I am thrilled that you are joining me to continue to read and have fun over the next nine weeks. Let’s use these first couple of days to get ready for the break and our summer reading journey. Here are some of the things you might like to prepare and pack in your (reading) bag/hand luggage. Can you think of anything else that might be handy on a reading journey? You all know that I keep a reader’s notebook in which I record all the books I read during the year. For the summer break, I always get a separate journal that functions both as a reader’s and as a writer’s notebook. Check the library blog (Capturing Summer (Reading) Memories), to have a look at what my journal looks like and get additional ideas for your own. You could keep one all by yourself, or you could make one as a family, to which everyone contributes. Create a reader’s passport. What might it look like? Get creative and think how it might differ/might look the same as your regular passport. I think mine will definitely have my name in it, a photo (or drawing) of me, favorite books, favorite reading places… and other things I like as a reader. You can also print a template from the Internet if you have access. 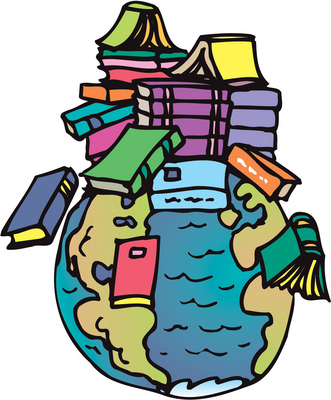 If you like and have Internet access, download a world map so that you can mark the different places you will visit during your reading journey. For example, here are some of the things I always carry with me: a box of different colored markers with me, a glue stick, a bookmark, post-it notes, pencils and an eraser. I love preparing for holiday reading! What a wonderful reason to go book shopping! I have already downloaded a number of books to my iPad – e-books to my Kindle app and audiobooks to the Audible and OverDrive apps. But I am sure I will be adding more and more as I always need a good selection to pick from. Create a list of titles you might enjoy to read during the break. You can explore the suggestions I have made on the library blog (you can download the file from the blog as well) or maybe ask a parent if they would take you to a bookstore or public library for some exploring. kidsGo Hong Kong, kidsGo Bali, kidsGo London, kidsGo New York, kidsGo Phuket, kidsGo Sydney. Leap & Hop Hong Kong, Leap & Hop Bali, Leap & Hop Paris, Leap & Hop Cambodia. This is Hong Kong, This is Paris, This is New York, This is Venice, This is London, This is Munich, This is Australia etc. Not For Parents : The Travel Book, Not For Parents : Rome, Not For Parents : London, Not For Parents : New York City, Not For Parents : Paris. ​“1. Read a book about a character who doesn’t look like you or live like you. You could repeat this challenge any time this summer. I hope you are having fun with it, discovering some amazing new stories. Today was a special day for 12 of our students (represented were kindergarten, grades 2, 4, and 5) as well as a group of students from the Sai Kung Central Lee Siu Yam Memorial School (LSY), the primary school right across the road from HKA. Organized by Ms Angela Leung, Program Director of Bring Me a Book Hong Kong, we all took part in the ribbon-cutting ceremony for the installation of a bookcase library at LSY. Back in March and April this year, our students had raised money with their participation in our annual read-a-thon. The money raised was in support of Bring Me a Book Hong Kong, an NGO promoting family literacy around Hong Kong and providing access to quality children's literature. With the amount our readers raised, BMABHK will be able to install three bookcase libraries and provide training for the librarians, teachers, parents and caretakers at the respective locations. LSY was the first recipient and being so close to our school, we were able to let some of our top readers/fundraisers come along for the event. The ceremony started with the LSY librarian and the principal welcoming us and expressing their gratitude for the donation. Then Ms. Angela Leung, Program Director of BMABHK, shared a few words. Then I had the opportunity to say a few words and explain to the LSY students how our students had managed to raise the money for the bookcase library through their reading efforts. Next came the exciting part: the actual ribbon cutting. It was wonderful that some of our students got indeed to do the cutting. It was easy to see that everyone's favorite part of the ceremony, however, was getting to the beautiful new books, a wonderful selection of picture books both in English and Mandarin, and reading them together. Our students did a wonderful job sharing books with small groups of LSY students. It was beautiful to see with how much confidence our students read, so comfortable in sharing a story with others. There was much excited chatter on the way back to HKA and I am sure our students had much to share when they got home today. The installations of the other two bookcase libraries, one at another school here in Sai Kung and another at a kindergarten in Kowloon, will take place in September. Many thanks again to everyone who supported the read-a-thon!